2 x Individual Trifles with Layers of Cadbury Milk Chocolate Dessert, Cadbury Milk Chocolate Mousse and a Chocolate Chip Cookie, Topped with Stabilised Whipped Cream. 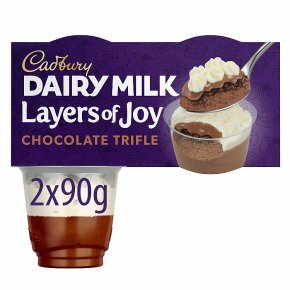 Cadbury Layers of Joy Trifle Desserts have a delicious layer of chocolate trifle with melted Cadbury milk chocolate dessert & chocolate chip cookie, topped with a fresh cream layer. The perfect chocolate trifle for that after dinner treat.